Icom's new innovative IP advanced radio system provides the ability to contact any member of your staff at any time utilising an existing or new IP/WLAN network. The WLAN based system offers a scalable license-free communication system using standard wireless networking products infrastructure, infrastructures that in many cases, may already be in place. To discover the benefits of Icom’s new Revolutionary IP Advanced Radio System, click Download Icom’s IP Advanced Radio System PDF Guide. Radio licences are not required for this system, when using standard wireless networking infrastructure. The system uses the IEEE 802.11 a/ b/ g/n. The IP/WLAN system from Icom offers a scalable licence-free communication system using standard wireless networking products infrastructure, which in most cases may already be in place. Secure encrypted communication is provided by the WPA-PSK and WPA-PSK2 wireless security protocols that encrypts calls. 12 full duplex calls can transmit simultaneously at any one time. With an optional headset, the IP100H transceiver can talk and receive at the same time like a phone call. The optional IP100FS software receives information about the location of each transceiver based on the access point to which it is recorded and represent it graphically on the screen. The IP1000C programs almost all transceiver configurations over the air. Individual PC programming via cable connection is not required. There are currently two versions of this IP Advanced radio system. Up to 20 users and up to 100 users. The mixing function receives multiple users voices at the same time. Multiple communication is possible and increases efficiency of information sharing. In a network consisting of two or more access points connected via IP, a transceiver can roam from an access point to another without losing communication. The IP100H/IP100FS can send status and short data messages* to other users. The IP100H vibrates powerfully when receiving these messages. * Preprogrammed message only for IP100H. In an emergency, the IP100FS can force an individual IP100H to transmit anything the microphone hears to identify the situation. If the IP100H is used by an unauthorized person, a remote kill command can be sent to disable the unit. * These commands can be transmitted from IP100FS. The IP100H can resist immersed in water up to a depth of 1 metre for 30 minutes. 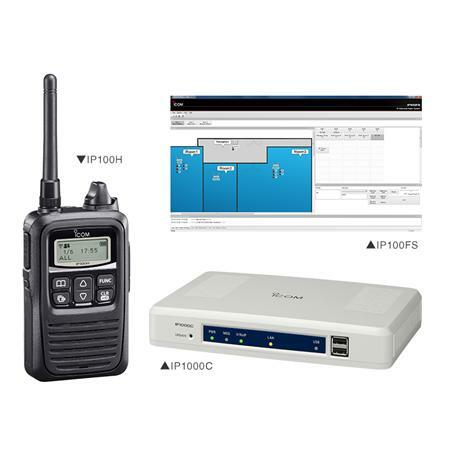 With the VE-PG3 RoIP gateway, the IP advanced radio system can interconnect with an IP phone, analogue transceiver and IDAS™ NXDN™ digital transceiver. Lithium -Ion Battery BP-271, antenna, belt clip and user manual. - Optional software IP100FS, which acts as a radio dispatcher.